After football, Cricket is the most favourite sports in the world. The sport of Cricket is full of glamour and wealth, that’s why every youngster in India wants to become a Cricketer. The BCCI gives salaries to cricketers based on their performance in matches as this encourages them to play better and win acclaim for the country. The high level Committee of Administrators set up by Supreme Court of India have announced the contract and salaries of the cricketers from March 2019. BCCI has divided the contracted players into 4 categories i.e. A+, A, B and C. As per new contract, player of A+ grade will get Rs. 7 cr. 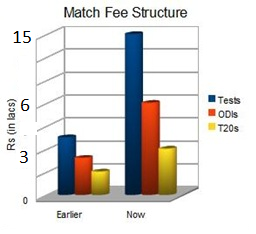 per year, A grade player will get Rs. 5 cr. per year and B grade player will get Rs. 3 cr per year while C grade player will get Rs. 1 cr annually. New contract has been applied since March 2019. 2. Each player gets Rs. 6 lakh to play an O.D.I. 3. Each player gets Rs. 3 lakhs to play a T-20 match. Note: The important point to be noted here is that money given under the BCCI contract and the money paid for each match is given separately. If a player scores a century in ODI or Test Match, he get Rs. 5 lakh as bonus irrespective of the grade to which he belongs. On taking five wickets, a bonus of five lakh rupees and on scoring a double century a bonus of Rs. 7 lakh is given to the player. 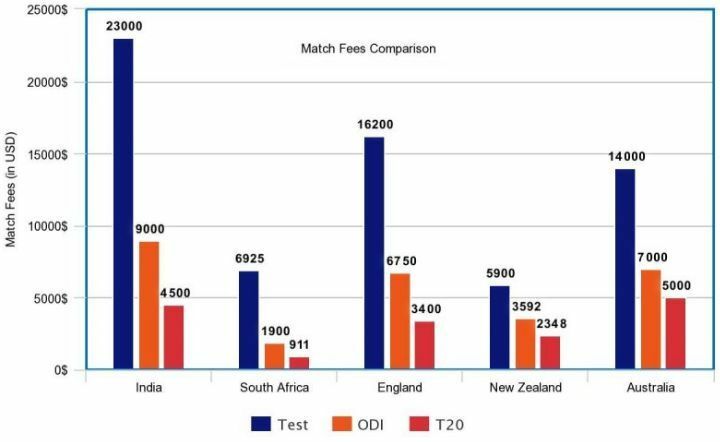 Thus the revenue figures mentioned above shows that cricket has a huge money and fame as compare to other sports in India. This is the only reason that big corporate house are much interested in sponsoring the players and tournaments related to cricket. 3296 Views Why is Sachin Tendulkar not included in the ICC Hall of Fame? 2554 Views What are Grey List and Black List of the Financial Action Task Force?